Steiff Unica Baby Unicorn Grip Toy with Rattle is hand made in the finest white cuddly soft plush. 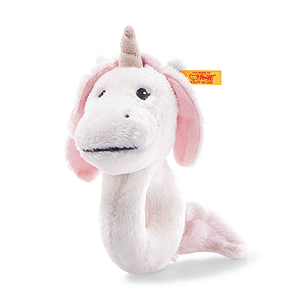 The 14 cm Soft Cuddly Friends Unica Babe unicorn grip toy with rattle is made of white plush fabric for your baby's soft skin. A rattle is hidden in her head. A beige fabric star with shiny edging embroidered in beige is found on the grip toy's ring. The beautiful animal has a beige horn, and her lovingly embroidered eyes, nostrils and mouth are a shiny grey. Her light-blue accentuated inner ears, pink and white mane and pink tail give her a rather special appearance.